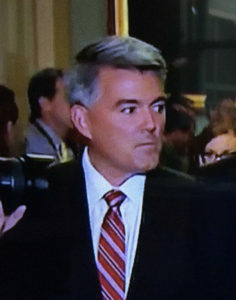 Apparently referring to information he received during a classified senate briefing, Colorado Sen. Cory Gardner is directly questioning the CIA’s widely reported conclusion that Saudi prince Mohammed bin Salman knew about the plot to kill journalist journalist Jamal Khashoggi. Speaking to reporters after the briefing, Pompeo said there is “no direct reporting” connecting the crown prince to the murder of Khashoggi. Mattis echoed that point telling reporters “we have no smoking gun that the crown prince was involved” in the killing. Mattis said he read all the intelligence reports and transcripts himself. Neither Mattis nor Secretary of State Mike Pompeo doubted the CIA directly in public comments Wednesday, so yesterday’s classified briefing was apparently the source for Gardner’s “clear” information about the uncertainty of the CIA’s Khashoggi conclusion. The CIA did not testify at yesterday’s hearing, and Gardner told Politico that CIA testimony would have been “helpful.” But that didn’t stop Gardner from casting doubt on the CIA’s reported conclusion. Gardner’s office did not return a call seeking to know the source for his statement that the CIA’s reported conclusion should be doubted. Gardner went on to tell Sengenberger that he’s committed to finding out the truth about the Khashoggi murder. SENGENBERGER: [00:00:00] And I want to start off with Saudi Arabia. Yesterday, there was a vote to kind of move forward with this resolution that would be endorsing a withdrawal of U.S. support from Saudi Arabia’s military incursions in Yemen, sort of a proxy war that’s going on between Saudi Arabia and Iran, as I understand it. You voted ‘no’ on this resolution. There were 14 of your Republican colleagues who did vote ‘yes’. What are your thoughts on this, and where does it go from here? GARDNER: [00:00:29] Again, I think Saudi Arabia needs to be held accountable for — and we need to find out and get to the truth of what happened with Jamal Khashoggi. And that is something that I am committed to doing. I’ve signed a global Magnitsky Investigation on Human Rights and making sure that we punish those responsible, including the royal family that may or may not have been involved in this. And of course, yesterday, you saw the public comments made by Secretary of State Mattis and Secretary — [correcting himself] or excuse me, Secretary of State Pompeo and Secretary of Defense Mattis — that there is “no smoking gun,” I think were the words that they used at the briefing. And so, what I am committed to, is making sure we get the bottom of that. But what I’m also committed to is making sure that Iran doesn’t gain a further stronghold in the Middle East, that terrorists like ISIS or al Qaeda-Arabian Peninsula don’t gain an advantage in Saudi Arabia and destabilize the region, which would devastate our great ally Israel. And so, I think it’s important that we continue to find out who is responsible, [and] hold them accountable, but also not allow Iran, ISIS, and AQ-AP a foothold in Saudi Arabia to destabilize the region which could then spread out to hurt our allies. SENGENBERGER: [00:01:36] One of my concerns though, about the direction things may have to head — at least, in the minds of some — when it comes to Saudi Arabia and Crown Prince Mohammed bin Salman, the heir to the throne, next in line. And he’s being accused — and reports are suggesting that the CIA thinks that he may be the one who gave the order for Khashoggi’s murder. And that would be something–. GARDNER: [00:02:05] [interrupting] Well, I would be careful of what the CIA is being accused of saying. And I think that was clear in a briefing yesterday. I can’t get into the details of it, but I would just be very careful about what the CIA does and doesn’t believe. SENGENBERGER: [00:02:15] Thank you. I appreciate that. But if it were to be found out true that he gave the order, one thing that I’ve been understanding — especially speaking with the gentleman I know you know as well. I’ve interviewed him a few times and talked with the former Ambassador Sam Zakhem about this, and that is in the Middle East, in the vast majority of countries except for Israel and to some extent Lebanon, it seems like you’ve got two situations in most of the countries in the Middle East: bad or worse. And there are a lot of reforms that Mohamed bin Salman has been taking leadership on, and it’s difficult to think of who would be any better than him, with some of the calls for his ouster by many of your colleagues in the Senate. GARDNER: [00:02:56] Well, this is the challenge we face. And that’s the challenge we face across the Middle East. We’re not dealing with a bunch of sweethearts, here, people who don’t share the same values as we do. So, the United States has to stand up for our values. We have to stand up for what we believe in. We have to hold accountable those people who carry out atrocious acts that violate human rights. But we also have to make sure that we are not putting Americans in harm’s way by abandoning our fight against terror or terrorists, that we’re not yielding the region to Iran, Russia, or China, that we’re not forcing the people of Yemen to suffer even greater catastrophe because you don’t have the kind of training that the Saudis need to target the military positions instead of civilians and the damage that can be caused to civilians. So, those are the kinds of values that we also have to talk about. So, that’s why I was proud to have continued the investigation into the Khashoggi murder to make sure that we find those accountable, while also figuring out exactly the right way to approach holding Saudi Arabia accountable as well as national security concerns in mind. SENGENBERGER: [00:03:58] And I should note Senator Gardner that you are a member of the U.S. Senate’s Foreign Relations Committee. So, definitely, this is an issue that you and your colleagues on the committee are paying very close attention to — as every senator is! But there’s a special focus, of course, on the — when you’re dealing with foreign relations issues. Sounds like there is a pretty clear consensus firearms were not involved. I've read of strangulation, beatings, overdose of sedatives, and bone saws. But never a gun. You read my mind, JiD. There was indeed, no gun. The tore him to pieces. I think it's looking increasingly as if Gardner is angling for a position in the administration. UN ambassador, perhaps? The UN delegates could be confuddled and dimblasted by Gardner's glibberish the way we all have been for years. It's a thought. A reward for making the Senate margin high enough to lose one seat without risking the majority? Methinks there is a seat in deep jeopardy for the Repubs.